Duidelijk is te zien dat JEZUS zijn neus was gebroken door de vuistslagen in zijn gezicht van de Romeinse soldaten en ook ziet men een zwelling op zijn jukbeen ten gevolge van die vreselijke mishandelingen en ook was zijn oog dichtgeslagen. It's clear that JESUS'S nose was broken by the fists in his face from the Roman soldiers, and one sees a swelling on his cheekbone as a result of those terrible abuses, and he had a beaten eye. ...want dat slaat op zijn BENEN, omdat de Romeinen op een gegeven moment een gekruisigde zijn scheenbenen kapot sloegen met een zware koperen staaf, waarna de gekruisigde alleen nog maar aan zijn handen (polsen) hing en niet meer kon ademhalen en na enkele minuten stierf door verdrinking in diens eigen longvocht.....zo is JEZUS ook gestorven, gestikt in zijn eigen longvocht, want Hij had de kracht niet meer om zich met zijn voeten (en die ene grove spijker erdoor) op te richten om opnieuw adem te halen en Hij liet zich hangen aan zijn handen (ondanks de vlammende pijn) en gaf de geest.....het was VOLBRACHT! 36 For these things were done, that the Scripture should be fulfilled, Not a bone of him shall be broken. ... because it refers to his LEGS because the Romans at one point broke the shinbones of a crucified person with a heavy brass bar, after which the crucified person only hung at his hands (wrists) and could not breathe again and after a few minutes died by drowning in his own lung fluid ..... this way JESUS died, drowned in his own lung fluid, because he had no power to lift himself up with his feet (and that one coarse nail through it) in order to breathe again and he let himself hang at his hands (despite the flaming pain) and gave up the ghost ..... it was FINISHED! Dit is een combinatie van de lijkwade en de artistieke impressie ervan en het toont overduidelijk het uiterlijk van een Joodse man. Maar dat portret IS gebaseerd op het gelaat van een overledene! Het zou dan onnatuurlijk zijn om er een 'glimlachende Jezus' van te maken. Maar toen de Heer Jezus opstond uit de dood kwam zijn glimlach terug op zijn gezicht! This is a combination of the shroud and its artistic impression, and it clearly shows the appearance of a Jewish man. But that portrait IS based on the face of a deceased person! It would then be unnatural to turn it into a "smiling Jesus". But when Jesus rose from the dead he got his smile back on his face! De Lijkwade van Turijn - Authentiek? De lijkwade redt niet, maar het geloof in het volbrachte werk van Jezus Christus aan het kruis via zijn vergoten BLOED om onze zonden en zijn opstanding uit de dood, redt wel! The shroud doesn't save, but faith in the finished work of Jesus Christ on the cross through His shed blood for our sins and His resurrection from the dead, does save! +FervorForFaith I know that the Roman Catholic DEATH CULT has STOLEN the shroud, and to this SATANIC institution, the shroud is proof of JESUS' existence and DEATH, because the Roman Catholic CULT is always showing a DEAD JESUS on a cross. Christ-Mass is in fact the 'celebration' of JESUS' DEATH! Others say that this EVIL church in fact owns a relic which testifies of JESUS' MIRACULOUS RESURRECTION, and I know that the Roman Catholic CULT in fact is very ambivalent about its ownership of the shroud. Bottomline: believing in the authenticity isn't salvational, but to some people the shroud is proof of a God who provided physical evidence of His miraculous resurrection, which defies the laws of nature, as one would expect of a SUPERNATURAL God. Have you studied the contra-expertise I've provided? But this piece of cloth exists almost 2000 years, and it used to be in possession of ordinary believers in JESUS, until the Roman Catholic CULT eventually took hold of it. Now this DEATH CULT possesses a piece of evidence of JESUS' RESURRECTION! The Roman Catholic CULT celebrates 'the fact' that JESUS is DEAD! But it's about the resurrected Christ JESUS on the third day, who died for OUR SINS and who was dead and buried according to the scriptures. 26 And eight days after, again his disciples were within, and Thomas with them. Then came Jesus, when the doors were shut, and stood in the midst, and said, Peace be unto you. 27 After said he to Thomas, Put thy finger here, and see mine hands, and put forth thine hand, and put it into my side, and be not faithless, but faithful. 28 Then Thomas answered, and said unto him, Thou art my Lord, and my God. 29 Jesus said unto him, Thomas, because thou hast seen me, thou believest: blessed are they that have not seen, and have believed. 30 And many other signs also did Jesus in the presence of his disciples, which are not written in this book. 31 But these things are written that ye might believe, that Jesus is that Christ that Son of God, and that in believing ye might have life through his Name. Salvation comes through HEARING and UNDERSTANDING the WORD of God! The Sudarium of Oviedo and The Shroud of Turin. The shroud hologram reveals a secret End Times message through 3D imaging. 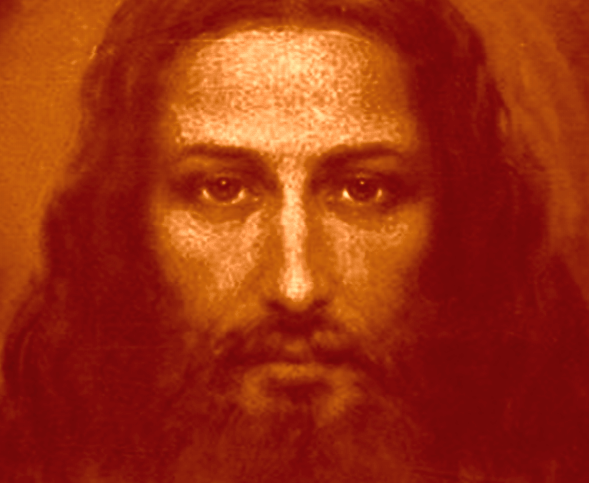 In the latest of the discoveries related to the Shroud of Turin, beneath the beard of Jesus, in the neck area, was discovered what appears to be a solid, oval shaped, apparently wooden pendent with the ancient Hebrew inscription עאנ (meaning "The Lamb"). 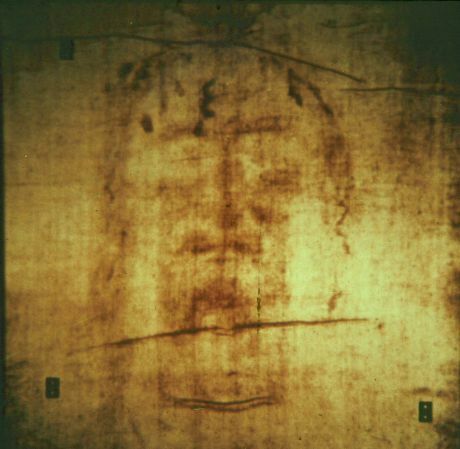 When photographed, the shroud shows evidence of resembling an X-Ray—the teeth and roots of the teeth behind the lips can be seen. Furthermore, the long fingers reveal the bone structure of the fingers and wrists underneath just as it would if an X-Ray were taken of the hands and teeth. The shroud is encoded with 3D information that is found from the spaces between the highest and lowest points of the body and its distance from the cloth. Recently, a VP-8 analyzer that gives topographical information about the moon and Mars terrain, was used on the cloth. Sure enough, a 3D holographic image formed of a man's face and body. Notably, the digitized Shroud photographs used in the 3D imaging were taken by Giuseppe Enrie in 1931. Those images were enhanced to improve details, translating the gray scale data into depth data, generating a sequence of up to 625 images of each of these, and combining these images with a Holoprinter to produce holograms. Later dated photographs do not provide the numerous details complementary to the development of holographic images. What could possibly cause a 3D image of a man to form on a two dimensional flat piece of cloth? The consensus of the science team is that most likely radiation coming from within the crucified body caused this 3D effect to occur on the shroud itself. In 1996, Dr. August Accetta injected radioactive technetium into his bloodstream and aimed a gamma camera at his body, capturing photos in much the same way doctors use the common procedure to make an image of a patient's internal organs. 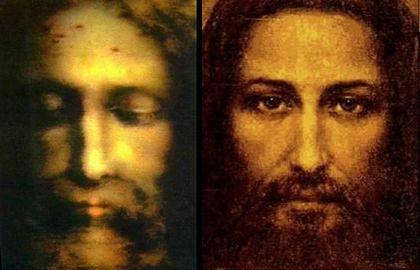 What he found were striking similarities between his radioactive body image and the image on the shroud. 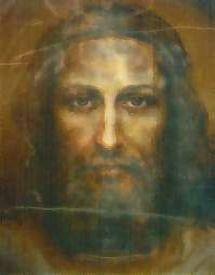 In a paper called "Nuclear Medicine and Its Relevance to the Shroud of Turin", Dr. Accetta hypothesized that if a corpse created the Shroud image, then the source of energy received by the cloth might be from the molecular bond energy and/or nuclear forces within the body in some way interacting with the cloth. "Accetta says only a miraculous event fully explains the image's sophistication. He thinks that when Jesus' body transmuted into a more subtle state, the shroud that had been covering the body began falling through the body by gravity. As the cloth dropped, Accetta theorizes it picked up corresponding energy—and corresponding 3-D information" (Orange County Register). Particle physicist Isabel Piczek suggests that the resurrection may have been caused by an event horizon, accompanied by forces above and below the body causing the shroud to become taut, where quantum time collapses to absolute zero, with the body hovering parallel to both with gravity suspended—explaining why the cloth's image is a negative film of a dead man on the front and back sides of the cloth. This had to be a mild or very weak event horizon (unlike the force of an event horizon of a black hole or the Big Bang). 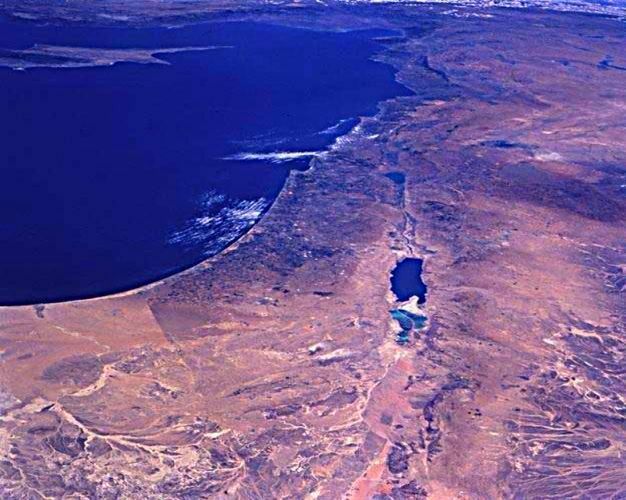 Indeed, as it stands today the Bible's written accounts of the death, burial, and resurrection occurrences describe earthquakes, a darkening of the sky at midday, and appearances and disappearances of the risen Lord in the weeks following. Someday these events may be fully explained by physics as well as by the miraculous such as that proposed by Dr. Piczek. In fact, Gary Habermas notes that one of the original physicists analyzing the shroud declared, "The image on the shroud appears to have been caused by something like millions of micro-lasers shooting out of every pore in his body, scorching the cloth simultaneously". In 2011, a team of researchers from the National Agency for New Technologies (ENEA) replicated something similar to the Turin cloth's image on linen. They utilized excimer laser irradiation in 40 nanosecond bursts, thus somewhat creating an image matching the coloration and depth of the Shroud's image (2011 NBC News). This reminds Christians of a passage in 1 Corinthians 15:52 that tells us we will be changed in the "twinkling of an eye" when we are resurrected, something akin to a 40 nanosecond burst of light. Cursus: hoe word je als God? The Anti Christ ; in plain sight? Ich bin wieder da! - Eccomi di nuovo! De wereld vergaat, maar vandaag is het mooi weer! Geert aan Cecilia Malmström: donder op! Wat doet de Heilige Geest in ons leven?